Needless to say, we arrived safe and sound in Quito last night. It was easy to get a cab and head to our hotel which was located in the heart of the old city centre. Given that it was well after midnight when we drove into town, the only thing that we saw was a long narrow strip of lights lining the valley of the surrounding mountains. The city seemed to creep up the sides in all directions! 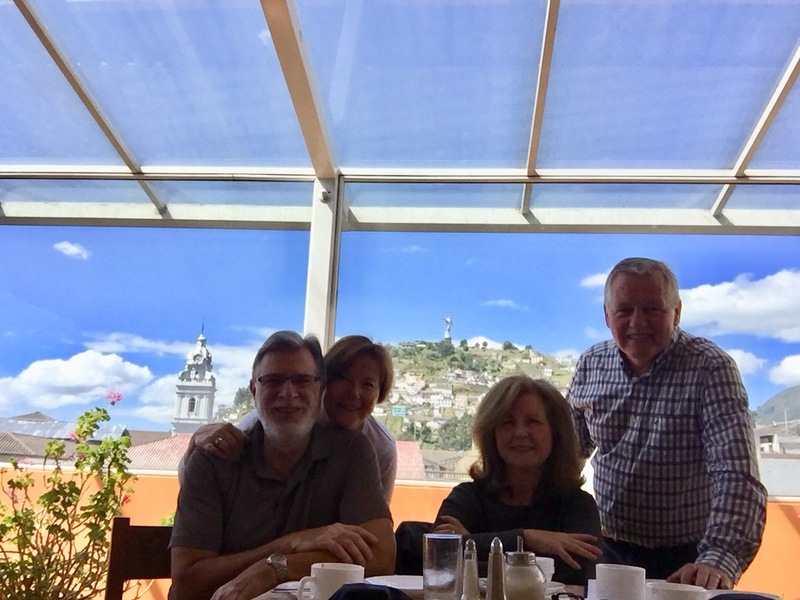 We met Glenn and Gwen for breakfast and discovered what an incredible location we had been dropped into last night! 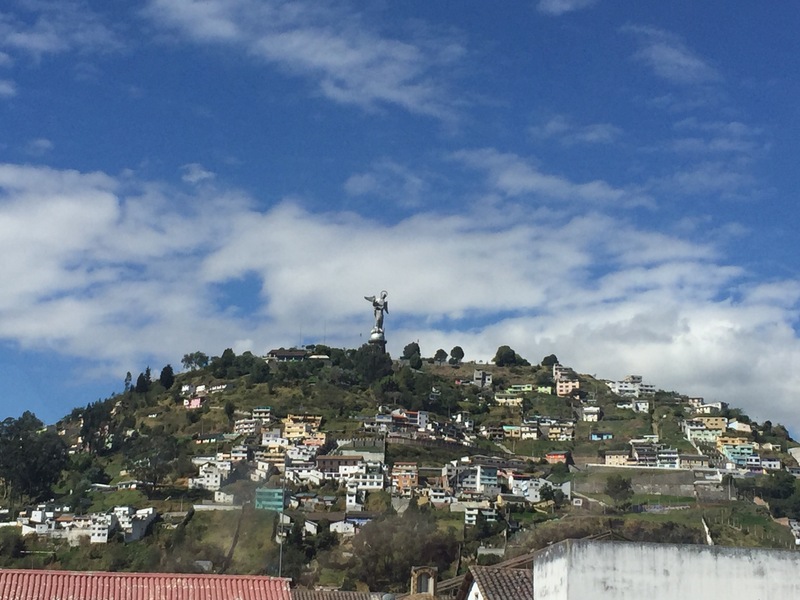 Watching over us on our stay in Quito would be the winged statue of Mary. After a delightful breakfast, we decided to head out and explore our neighborhood. 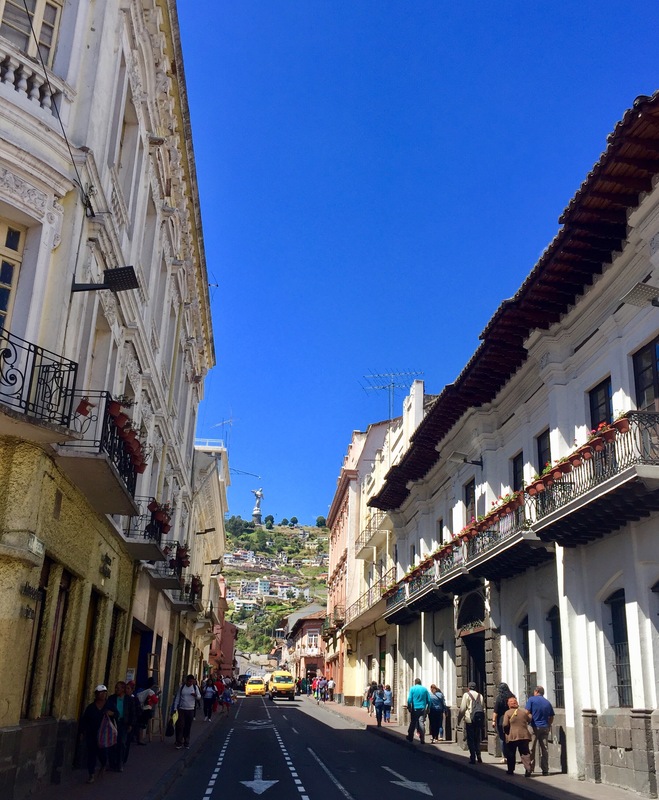 The streets are narrow in the old city, and the drivers are both aggressive and tolerant of sidewalks spilling over with pedestrians. 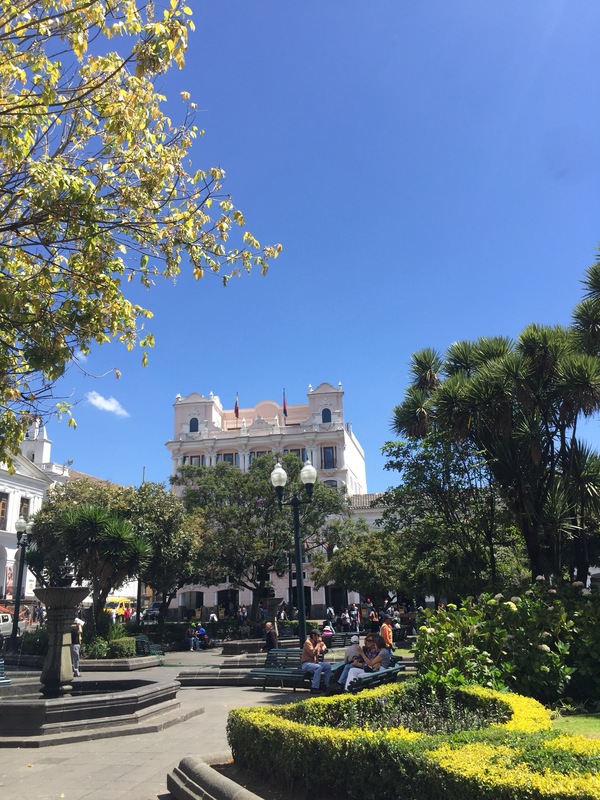 Not far from our hotel we came across La Independencia Plaza, a lovely park that sits surrounded by the presidential palace, the Palacio Arzobispal, the catedral and the Centro Cultural Metropolitano. The above edifice is of “La Campania”, which is the most opulent church I have ever been in. It is said to have 7 tonnes of gold used as gold leaf! After a quick bite for lunch, we hired a driver to take us to some points of interest outside of the city centre. 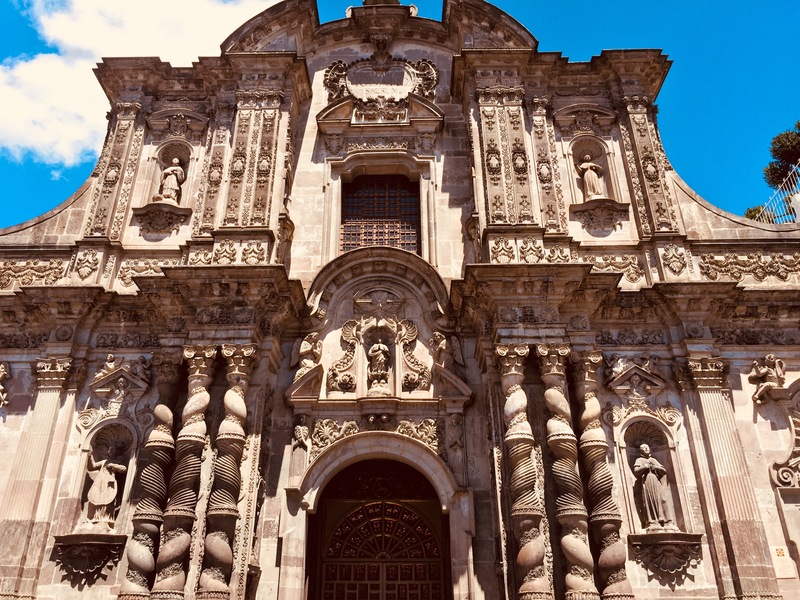 The drive north of the city towards the equator was fascinating as we passed the new city centre, and traced the city of Quito like riding a serpents back. As you can imagine, there was quite a lot of graffiti along the road sides, but none more interesting that this! 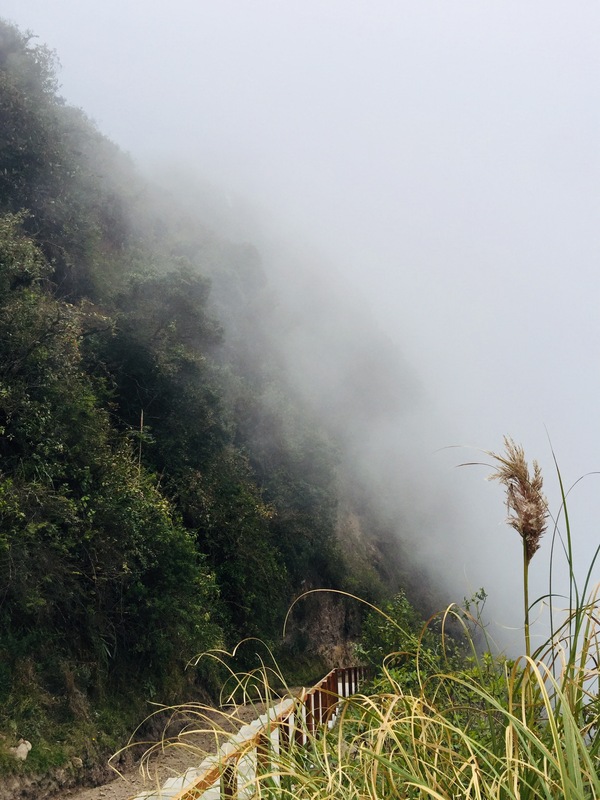 Our first stop was at the Pululahua Geobotanic Reserve. This was the site of a large caldera, or volcanic crater which hasn’t been active in over 1,000 years. We arrived there at around 2, and the cloud mists were starting to consume the valley. Apparently, according to our driver, the farmers who work the valley have to stop by 3 pm, because the cloud cover is so thick that you cant work! 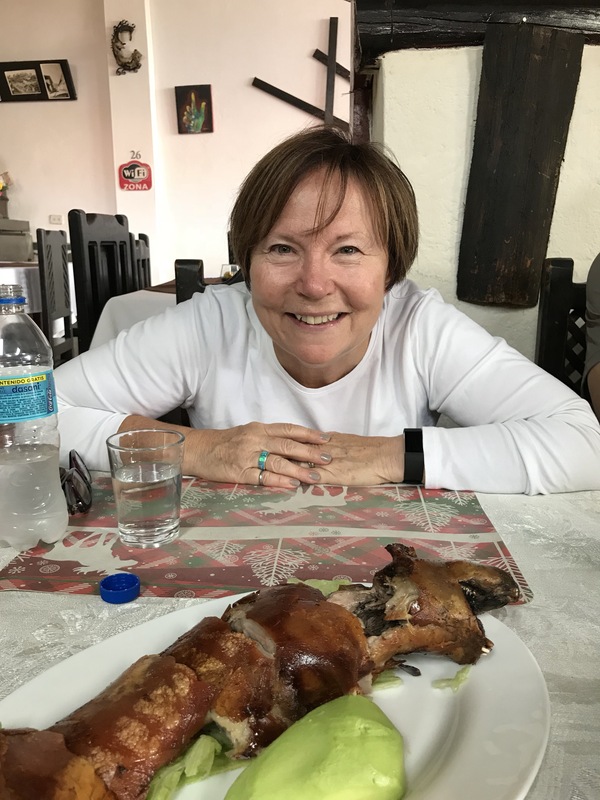 As we left the reserve, our driver asked us if we had tried the traditional dish of Ecuador, roast guinea pig, or Cuy as it is called here. He told us of a place that was featured on the Travel Channel with Andrew Zimmern’s Bizarre Foods. Well, of course we had to check this out!! 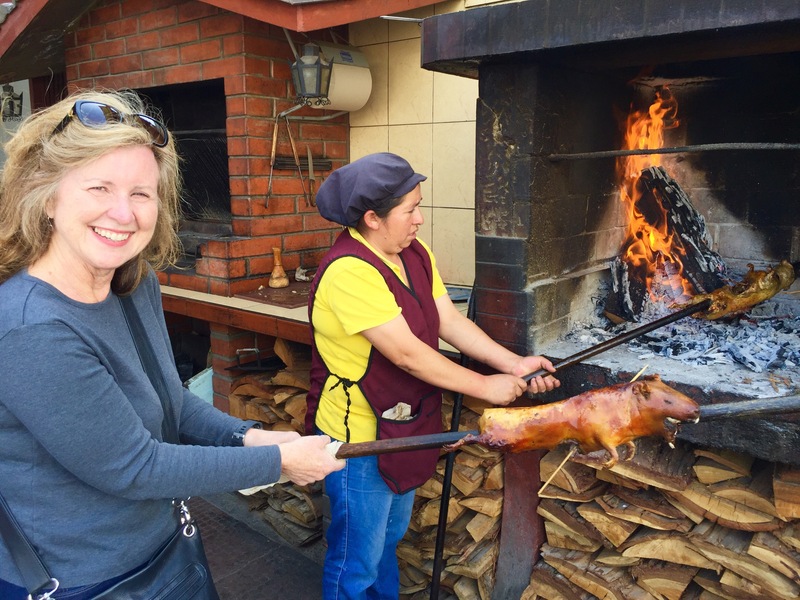 After this delightful tasting adventure (it actually is somewhat like roast suckling pig), we were off to the museum Inti Nan which is located right on the equator! So, the geek in me was out in spades here. The fun part started when they brought out the golden sink. 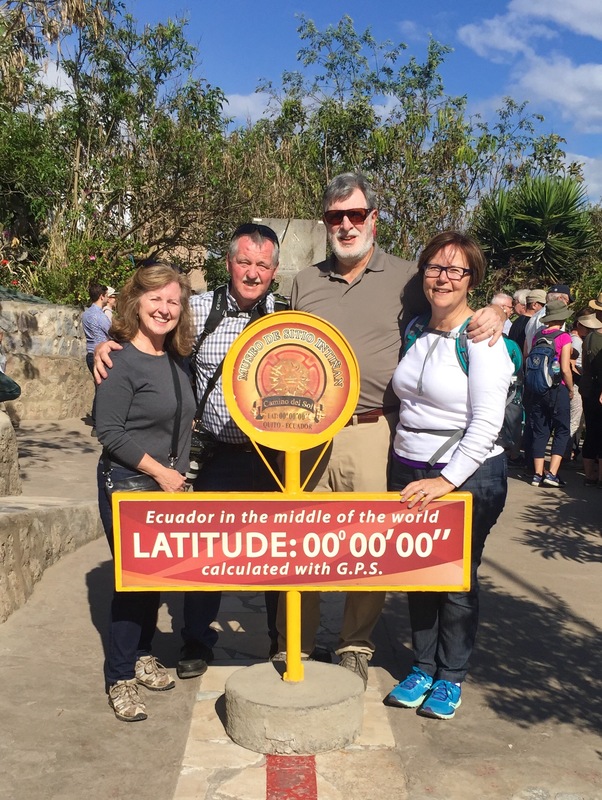 First it was set on the equator line…exactly! And here’s what water looks like flushing over the equator!​ Yup, it goes straight down. 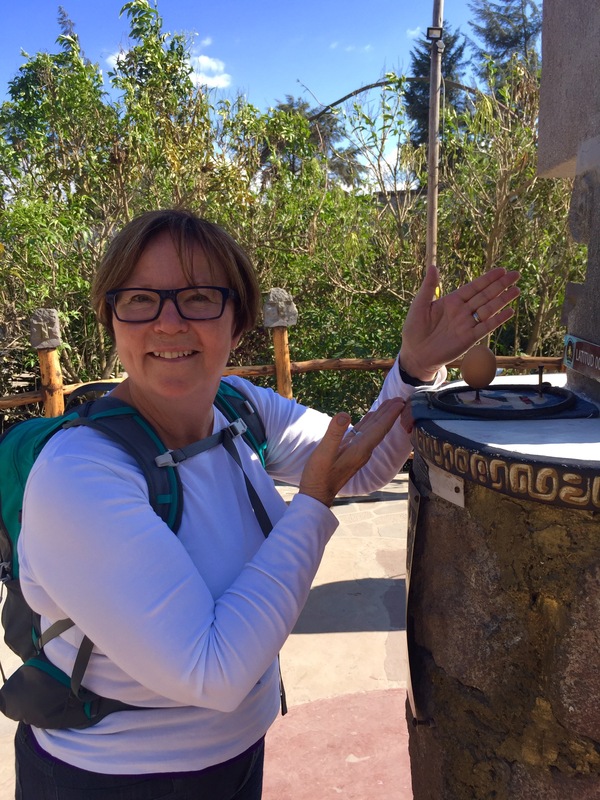 The other fun thing that I got to do was balance an egg on a nail on the equator! 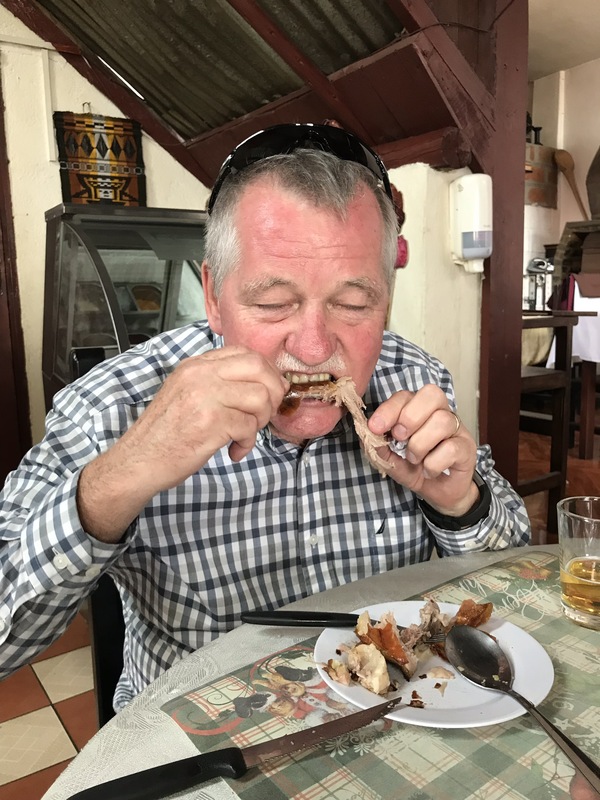 After trying feats of strength both on and off the equator, as well as trying to walk along the equator line (oh yes, and we did learn how to harvest and made chocolate!). 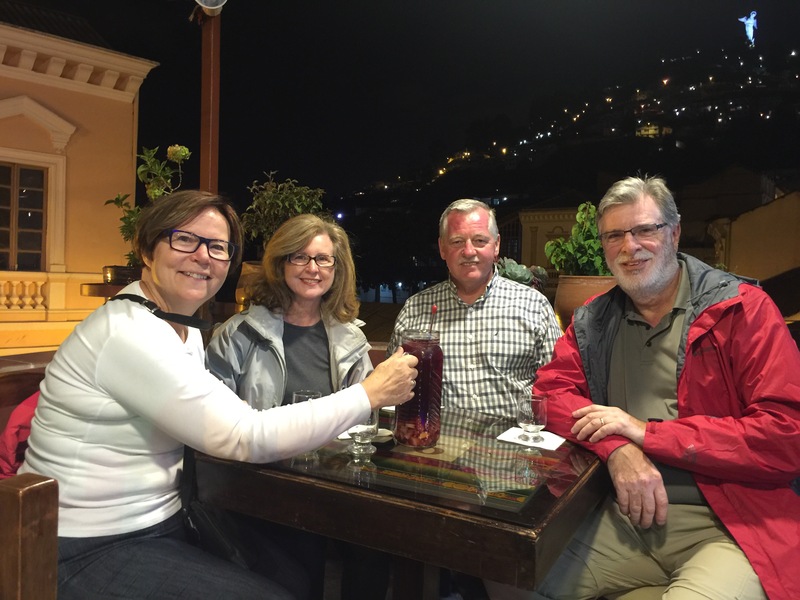 It was time to head back to Quito. Along the way, we made a stop at the monument for La Mitad de Mondo, or the Middle of the World. While impressive, it’s 240 M from the actual equator. What was more impressive was the UNASUR headquarters (organization of South American nations, which seemed to defy gravity! With our day filled, it was time for a relaxing dinner on a beatiful terrace being watched over by our winged protector and guardian of the city, it was time to say goodnight! Looks amazing!! Love the equator experiments. Haha! Thought you might! That’s a very Markovich kid kinda thing! What an amazing experience! Looks beautiful. The geek in me loves the equator post with the sinks. Glad you are having such a great experience. That was one of my favourite parts! It’s lots of fun!